The microphone still hopeless entangled when it’s Roger cue to sing, he has little choice but to bend toward the mic. Pete doesn’t realize the problem at first, and Roger is forced to follow him around like a puppy to stay amplified. When Pete does realize what’s happened, he smirks and pats Roger on the back. As for the DVD as a whole, well, the sound and audio quality is pretty poor—basically “VHS transfer to DVD” quality. And I’m not sure the band were really at their best, at the end of this long tour, slightly hating each other at that point. In retrospect, of course, it’s probably just as well this wasn’t their very last show. They had many highlights to come, including their amazing performance at the Concert for New York in 2001, and closing out the London summer Olympics in 2012. But the 1982 show does have its moments. 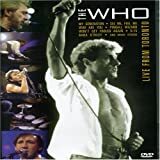 Categories: Music | Tags: live music, Music, Roger Daltrey, The Who | Permalink.